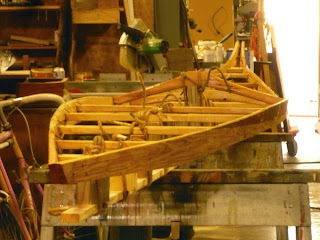 Yesterday I set up the frame of the EA kayak and gave it a second coat of linseed oil. 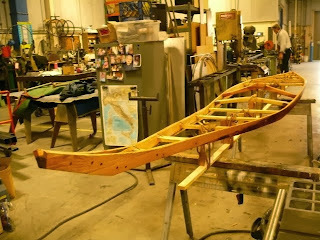 With the keelson blocked in and the deck upright, it is easier to see what the boat will look like when finished. 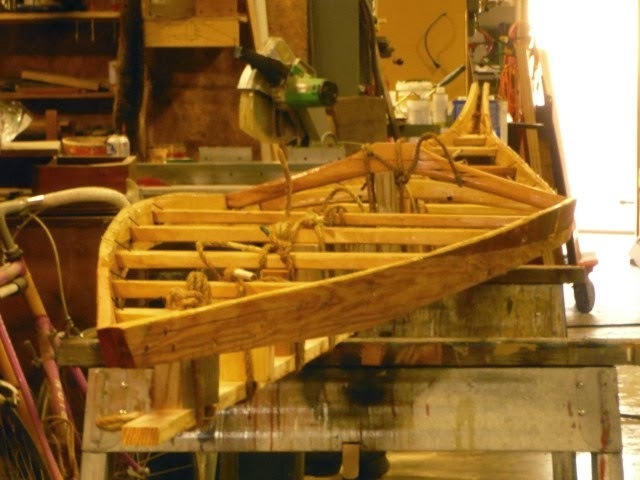 Supposedly, the finished boat will not trim with the waterline parallel to the keelson. The keelson will in fact sit lower in the front than in back. But we will see. Nose forward view accentuates the upsweep of the deck forward of the cockpit. View from the back shows the downward slope of the deck at the steern. And one more view from a slightly lower angle. At this point, I find myself wondering what this boat will turn into and how it will behave. 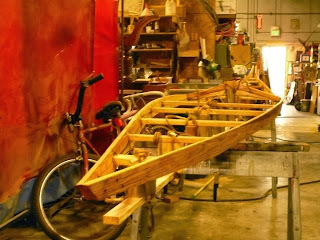 This is of course one of the compelling things about building a boat of a kind one has never built before. Invariably, there will be some disappointments and in time, pleasant surprises as well. Still, if nothing else, the curved lines of a boat are delightful to look at. Wolfgang: I'm guessing, but believe one of the reasons for the hull to ride deeper in the front is that it makes the boat less likely to broach when overtaken by a following wave. 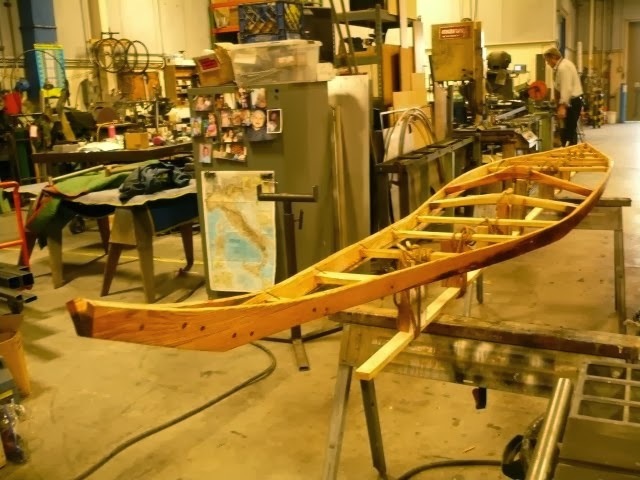 Secondarily, on a boat with equal depth bow and stern, the stern normally responds more readily to a sweep stroke than the bow, just due to ergonomics (you're pulling toward you at the start of a full sweep, but pushing away from you at the end of it). With this characteristic enahnced by a shallower stern, it should be even easier to quickly spin the boat, enhancing maneuverability.